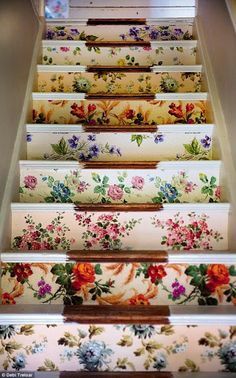 I’m ready to make over my front hall and stair-case I pulled some photos from Pinterest for inspiration. My there are some really creative people out there. 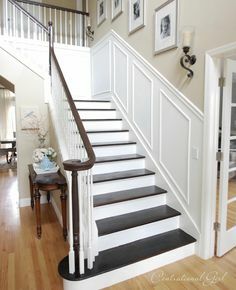 Believe it or not, I’ve been thinking of going with neutral tones on the wall and trim and a traditional black and white stair case. 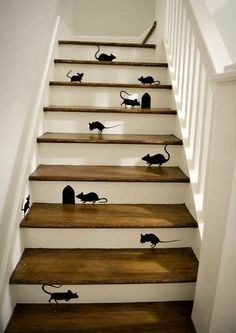 I bet my cats could arrange for me to have real mice on our stairs. Of course they would be belly up, with their heads chewed off. Wonder how all black would look? 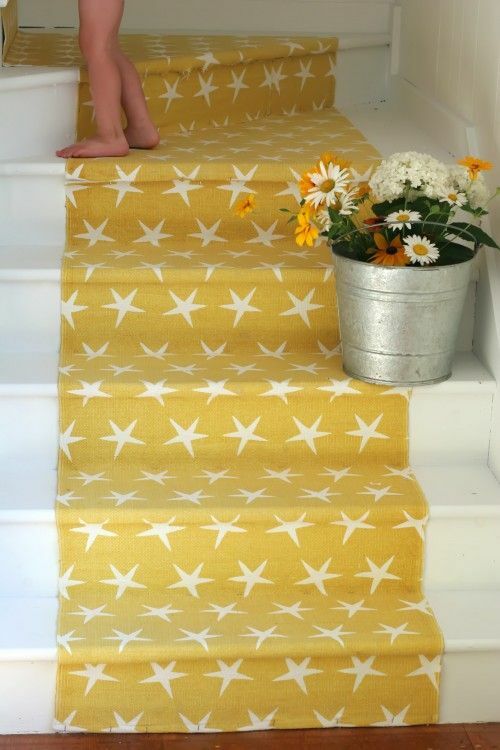 Ooohh I’m liking this one, it feels really cottage appropriate. Mr. Cottage and I are heading to the paint store for some ideas. 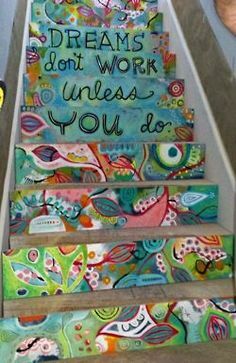 Do any of these inspire you? 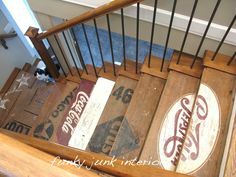 Kim of Red Dirt Farm • This entry was posted in Country living, DIY, Uncategorized and tagged country home, country living, decorating, diy, house decore, make-over, paint, painting, Painting ideas for staircase, stair case make over. Bookmark the permalink. 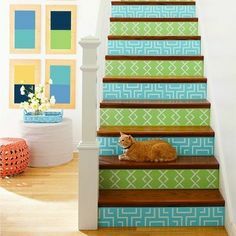 i like the multi pastel with the dark treads. Believe it or not, we are discussing staining our floors dark. I kinda like that too, it has color but it isn’t over whelming like what I have now. 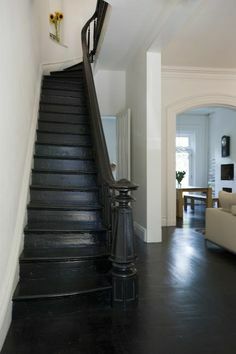 I like dark floors – your house is big and open and could support dark floors. 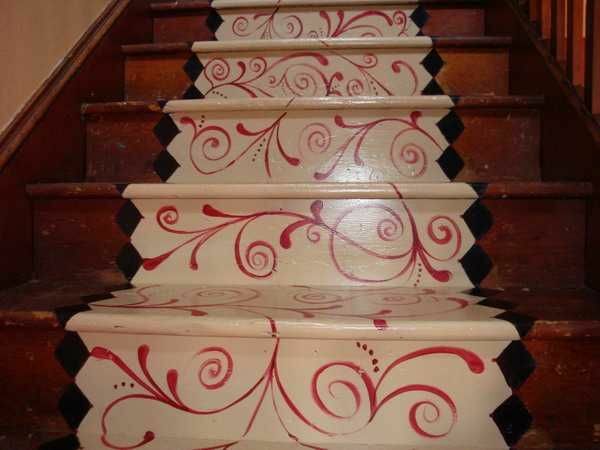 The ivory “runner” with the red scroll design caught my eye! 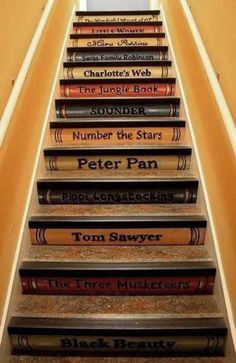 The “dreams” staircase really caught my eye but I’m all over that white trim with black stair steps, too. The last one is not painted on there. 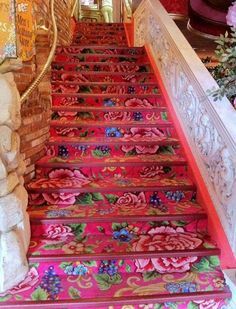 That’s a stair runner in fabric of some sort. 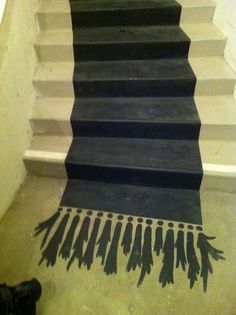 If you did it with paint, you’d have to use a stencil but how do you prevent seepage under the stencil? I love the book titles and the stars. 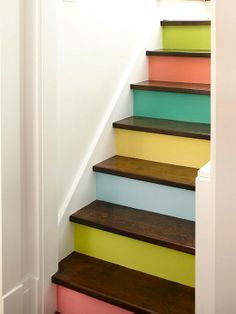 Last winter, we rented a little house in West Virginia for a ski weekend and there was a back staircase painted in pastels just like the one in your post. I’ll try to dig it up. Can’t wait to see what you decide. Fall inspires decorating projects around here, too. I’m looking forward to seeing what you do Kim, I like them all but my Ruby would hate the mice one! wow! 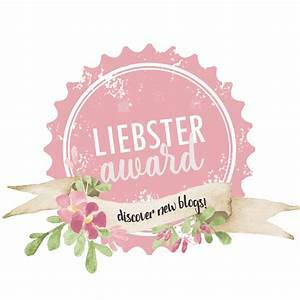 I can’t wait to see what you’ve done. I think I like the black and white the best, but also the numbered one-it would be fun for kids…I’ve got to do our own someday, so you’ve given me lots of inspiring things to think about!